Blog Cloud Services Are you ready? Have you tested your Disaster Recovery? In honour of the recently released Rogue One: A Star Wars Story, here is a guest post from our partner, Zerto, on the ever-important topic of disaster recovery (DR). At Zerto, there is perhaps one character that we relate to more than any other one in the Star Wars universe– R2-D2. (The only thing that would have made him better is if he was painted Zerto red). We like to think that we embody the qualities of Artoo – we’re both awesome and we both know how to get things done when it matters. Artoo is loaded up with every tool in the known universe all in one organised case. You could call him the resident fixer, but we just call him prepared. You have to face it – without R2-D2, things would not have gone as swimmingly for the heroes of the story. Here at Zerto we like to test things. We don’t just fly by the seat of our pants and hope everything works out. We want to know that they’re going to work every single time, we do not leave it to fate. And Artoo? Well, we shudder to think what would have happened if he’d gotten lost on the way to Dagobah with Luke Skywalker. What if he had no idea how to fix a hyperdrive (having never done it before (at least as far as we know)) so the Millennium Falcon couldn’t escape Cloud City? Even in the latest release, The Force Awakens, if Artoo had not woken up to deliver the map, what would have happened? We know that for the sake of narrative flow, the scenes of R2-D2 being tested before every battle were probably left on the cutting room floor, but the reality is that just one tiny failure could spell complete disaster for the Rebel Alliance. Shifting hyperdrive gears here though … Back in our galaxy, a short time ago and fairly close by, Zerto and Macquarie Cloud Services decided that the companies we work with can’t afford to take these kinds of cinematic, dramatic chances with their business operations. Enter a solid, tested disaster recovery process. Even if we forget best practices for disaster recovery, for a lot of companies, testing your disaster recovery plan is not just a best practice, but an actual, legal requirement. Even so, there’s still a huge number of companies that just don’t. Look, we get it. 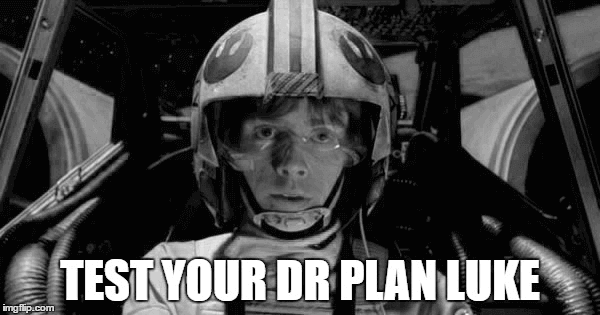 Testing your disaster recovery plan is often more trouble than running into a gaggle of angry Ewoks. It usually takes a team of people working overtime on the weekends just so that normal business operations aren’t disrupted. But a plan that’s meant to keep your business running smoothly shouldn’t cause extra stress and disruption. 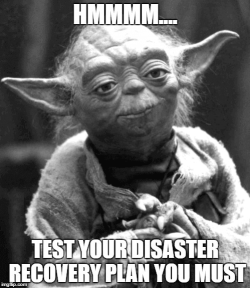 Consider Zerto as the R2-D2 for your disaster recovery plan. Make sure that there’s less of a snowball’s chance on Tatooine that your company will suffer a catastrophic failure. Test during an average workday – not the weekend. No need for a team of people. With Zerto, one person can test with a few clicks of a button. Confident you are that your data is recoverable within seconds of an incident. Use one Graphical User Interface to manage your disaster recovery plan. Remember, when the bantha fodder hits the fan, disaster recovery is our last hope. Make sure that The Force is with you by using Zerto and Macquarie Cloud Services for DR!